For processing of garments use different tools: needle, scissors, thimble, centimeter ribbon, etc. needle size are chosen depending on the processed fabric and thickness of thread. Thimbles also are classified by numbers, have a conical shape, can be with bottom or without bottom. Thimble with bottom it is recommended to use in the manufacture of clothes from light fabrics and for the production of more dense tissue is better to use a thimble without a bottom. Scissors are mainly used in three sizes - large, medium, small. Shear blades should always be well sharpened. The tape is used for measurements with the human figure, dimensions of parts, patterns, etc. have to be Measured to the same edge of the tape, otherwise the result may be different. In addition to the tape measure used and even a metal tape measure. For drawing lines and marking measurements requires another line. Chalk lines are applied on the details of the products. The edges of different colored crayons should always be sharpened to get thin. On fabrics where chalk traces difficult to remove (thin dress fabric), instead of chalk, you can use a well-sharpened pieces of soap, traces of which can then be easily removed with a dry piece of cloth. When performing manual work used and accessories such as peg, cutter, patterns, etc. Peg is a wooden, bone or metal rod pointed from one side end. Peg is used to puncture holes in the details of the products, the alignment of the rounded holes in the parts, smoothing the corners in detail, flanges, valves and removal of thread connections. Cutter is a easy rotating metal disc with sharp teeth attached to a metal rod, which is placed on wooden handle. It is used for transferring the lines from paper to fabric and fabric to paper, and the corresponding paired items. When using the cutter on the table lay a piece of cardboard rubbed with chalk or carbon paper. On cardboard backing laid down the fabric on which it is necessary to move the line and put on top of the part (face down) on which you want to move the line. The cutter is mounted on the portable line and move myself, gently pressing. On the lower part of the line of movement of the cutter remains the trace of chalk from the cardboard. Details of garments are connected by one or more mutually interwoven threads. Such a connection is called a stitch. The number repeated on the fabric stitch is called stitch. One or more lines imposed for fastening two or more sections of fabric to form a seam. When performing manual operations using various types of stitches: straight, oblique, notched (slotted), hook-shaped, looped (Fig. 452 a, b, C, d, e). Straight stitch the simplest and applies to all cases for temporary bonding of parts between the connection details in preparation for fitting. This run a running stitch, basting, vymetaya, zametnye, copying lines as well as lines for the formation of assemblies in light clothing, jewelry. basting stitching (Fig. 453 b) is also used for temporary bonding of parts. The value of live stitches at namatanai or primitivnyi parts without landing between 3.0 and 5.0 cm, with a rise of 1.5-3 cm. Zametica line (Fig. 453 in g) used for temporary securing of parts edges or folds of fabric. The value of the straight stitch when you cover your parts 1.5-3 cm. Oblique stitch is widely used for temporary and permanent bonding of components. For temporary bonding and basting are used vymetaya lines slanting stitch. Vymetaya line (Fig. 454) used for the buttonhole edges parts as in thin and in thick tissues, since the oblique stitch firmly establishes Kant. Stitch length of 0.7-1 cm. For permanent bonding of parts used in quilting, blindstitch and overlock stitch slanting stitch. 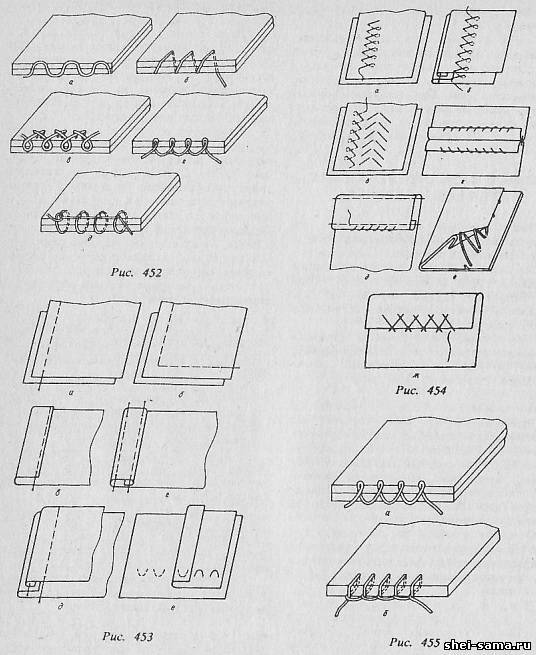 Quilting stitching (Fig. 454) is used to bond the two layers of fabric. It increases the elasticity and stiffness and is used to wystawiania lower collars, the sides and t,p. in street clothes. When running quilting stitch slanting stitches have separate rows at an angle to the longitudinal threads and tighten. The imposition of stitches on the collar or bottom side of a gasket sewn to fabric top, while grabbing only part of its thickness. In this case, the seal should not be taut against the fabric top or as they say, to have a fit. blind stitch line (Fig. 454 d, e, f) is used for permanent fastening bent edges of the parts (bottom, sleeve, hem, etc.). To do this, first podymaetsja entire allowance on ACC and primitives at a distance of 0.5-1 cm from the fold with a running stitch. Then cut podymaetsja 0.5-1 cm and primitives at a distance of 0.2-0.3 cm from the second fold. Blind stitch seams are of several types: simple (open), countersunk, shaped (cruciate). A simple blind stitch seam as follows: post-bend needle captured 2-3 threads of the main part, is injected under the fold, and the needle pushed through. Density seam - 2-3 stitch on 1 cm of the fabric. A hidden blind stitch seam. The whole tacked on allowance for ACC lamellae on the front side, on the inside remains 0.2-0.3 cm bent slice. The thread is fixed in the allowance for ACC, a needle is inserted under the crease filed the edges and captures 2-3 threads of the main part. The line is laid from right to left. Filament tight is not delayed. Density seam - 2-3 stitch on 1 cm of the fabric. loop-like stitches (Fig. 455 a) is used only to perform the stitching permanent bond. This stitch process the slices in the loose tissues. A needle is inserted from the top down, the thread of the previous stitch lies under the needle, the line is laid from left to right. Density seam - 2-3 stitch length of 0.4-0.6 cm to 1 cm of tissue. Looped stitches (Fig. 455) used for serging loops. When the buttonholes on products from bulk tissue edge loop pre-light overcast stitches so the thread does not crumble. For greater strength loops at a distance of 0.2 cm from the edge of the cut lay the thick thread, which then overcast loop. The frequency of the location of the stitches depends on the thickness of thread and fabric. For the formation of the clips at the ends of the loops are laid 2-3 stitch and overcast stitch them over the edge.That the loop was beautiful, the fabric should be pierced from the bottom up, making punctures at the same distance from one another and from the edge of the slice.